Crapsy Clay Falls is located in the northern end of Letchworth State Park about 36 miles southwest of Rochester, New York. The waterfall derives its name from the Crapsy family that once owned the land where the falls is located, and from the clay deposits found upstream of the waterfall's crest. This 200 foot high waterfall can be seen from the Highbanks Trail (number 20) south of the Highbanks Recreation Area. 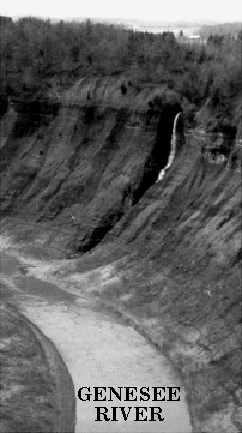 About 60 feet of the waterfall are visible in the animation. The animation may take a minute or so to load. The six photographs used in the animation were taken on a very windy day by Scott A. Ensminger in March of 1991. Copyright © 2016 by Scott A. Ensminger.